Location, location, location. 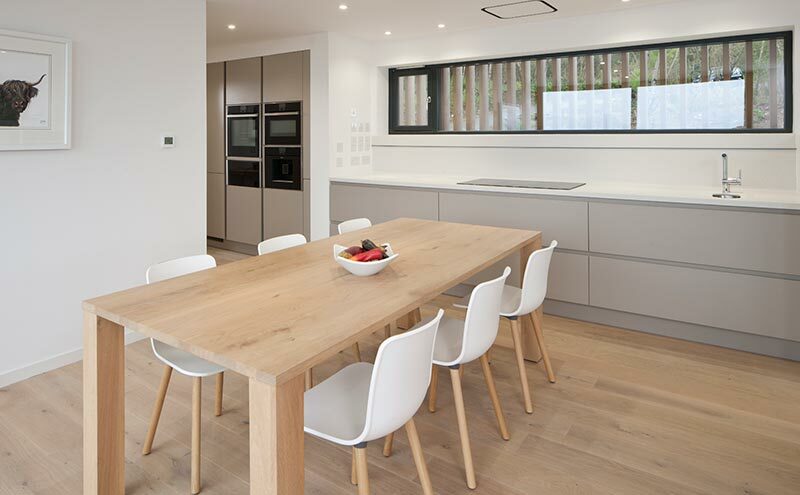 It’s not just the estate agent’s mantra, it’s the architect’s too – if for different reasons. 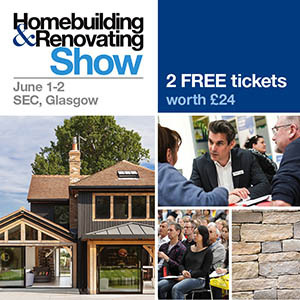 Being sensitive to the site and its surroundings is a key consideration when planning a new house, and one that, if you get it right, can have a hugely positive impact on both the building and the people who live in it. In the case of this house, the site informed the whole project, and its success can be seen in the fact that it already feels like part of the landscape. 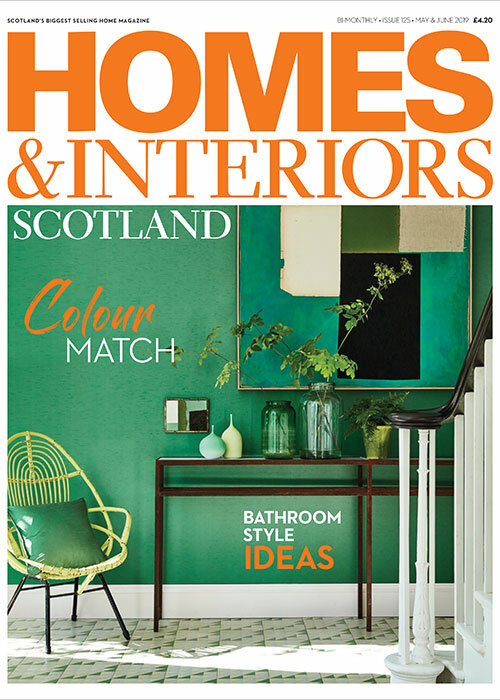 The Gibsons had told the architects that they wanted their new home to function as a B&B for part of the year, so had requested at least three bedrooms, all with en-suite facilities. 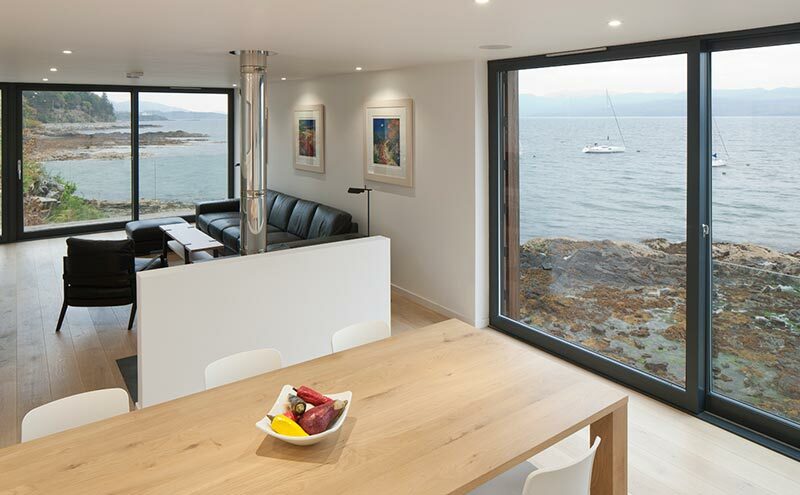 Cut into a rocky escarpment overlooking the Sound of Sleat, the recently completed building is quite deceptive. From the side facing the road, it appears to be a simple, single-storey home that looks out to sea. From the other side, however, it has a much more dramatic form. It has been sunk into the rocks below, in order to be as close to the shoreline as possible, which gives it incredible views out across the water from the windows of the lower storey, where the bedrooms are. As you approach it from the driveway, your eye follows the line of the roof straight out to the seascape beyond. The double-aspect living space has sea views from both windows. “You feel a bit like you’re in a boat when the tide is in,” remarks Alan. He and Jane have named the house Ancala, from the Gaelic for ‘harbour’, which seems very appropriate. Water is not the only element that has informed the build, however. 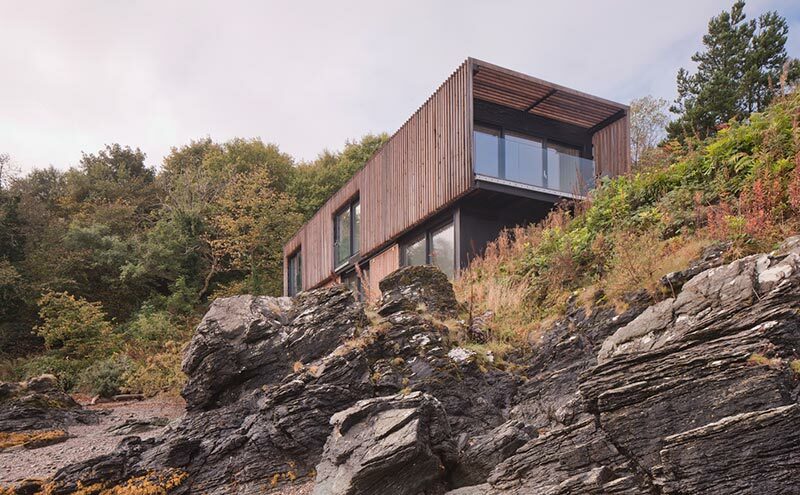 Its larch cladding means it is also very sympathetic to its wooded site. The timber-framed property is essentially a rubber-coated waterproof box sitting on a concrete base, and wrapped around the entire structure (including the roof) are untreated Siberian larch ‘fins’. 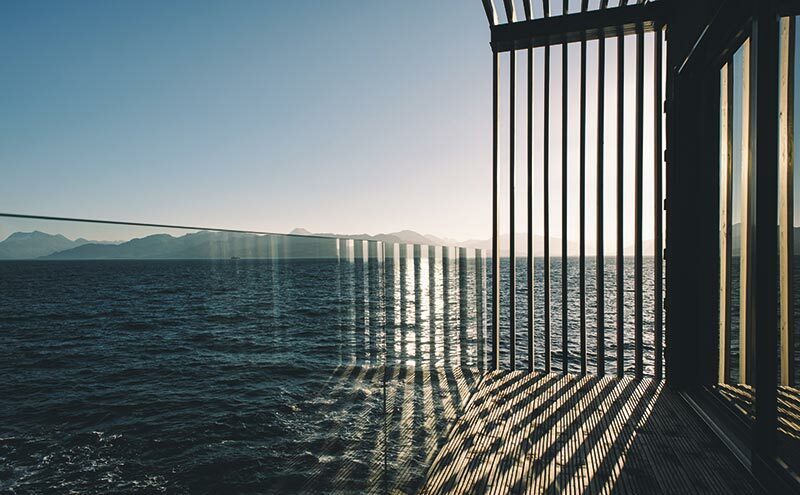 This cladding (made from timber supplied by Russwood) gives Ancala a distinctive character and creates very atmospheric shadows as the sun moves across the sky. It’s not just there for aesthetic reasons, though; it’s practical, too, dressing the windows so that curtains or blinds are unnecessary, and providing protection from the elements. 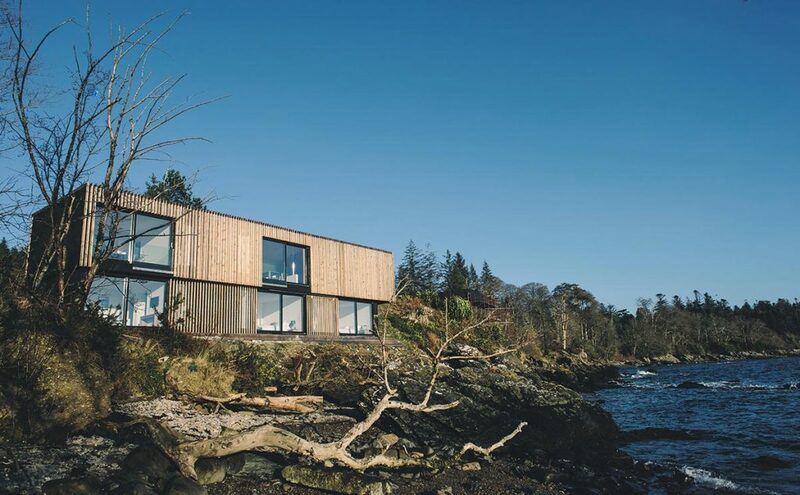 The fins help to form an east-facing balcony at the owners’ end of the house, so that anyone sitting out, enjoying the sea views towards Knoydart, will be sheltered from the wind. 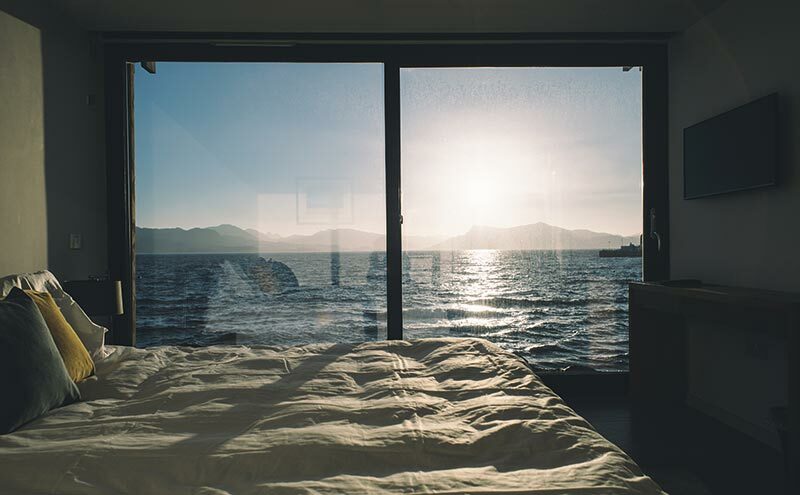 Floor-to-ceiling glazing by Nordan on the shore side feeds into the illusion of floating on the water, enhancing the sense of tranquillity enjoyed by this understated structure and generating a feeling of total relaxation. For anyone seduced by the Skye landscape and wanting to gaze out at those gentle waves across the Sound of Sleat, the exceptional Ancala is living up to its name, providing a welcoming harbour at which to dock for an evening or more.